Spirit of Delta crossing Loop Road, a public street near Atlanta International airport, as it is moved to it’s permanent location at the Delta Museum within Delta's World Headquarters. Photos of ship 102 "The Spirit of Delta" while it is parked outside of museum in the General Offices parking lot. Ship 102 parked outside of Hanger 2 with employee ceremony for museum addition. 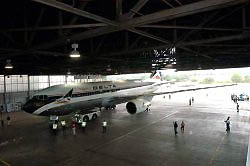 The Spirit of Delta has been repainted to its original livery and will feature a video viewing area in the first class cabin, and an exhibit area and presentation room in the economy cabin. 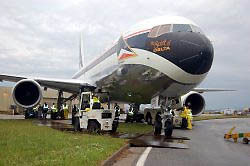 The aircraft will be carefully towed from Hartsfield-Jackson Atlanta International Airport across public roadways to Historic Hangar II at the Delta Heritage Museum. 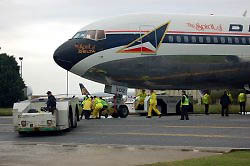 The aircraft is retiring adjacent to Ship 41, the first Douglas DC-3 to carry Delta passengers in 1940, and a 1931 Travel Air, symbolizing Delta’s first passenger aircraft. 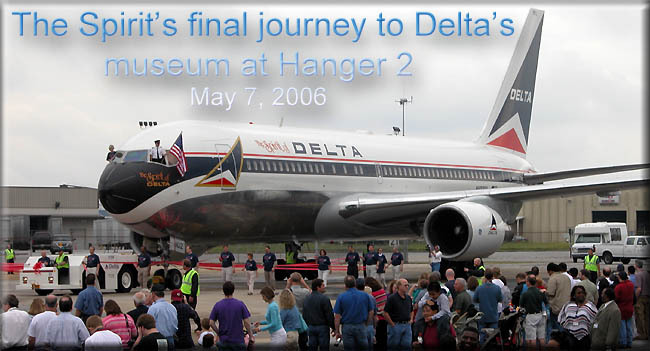 The farewell tour, all aircraft modifications and the plane’s permanent exhibit were made possible through financial support from Boeing and Delta Heritage Museum donors. 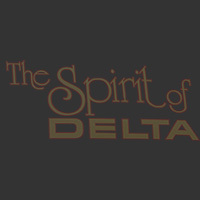 On Dec. 15, 1982, Delta employees and friends gathered at the airline’s Technical Operations Center in Atlanta to present the company with its first Boeing 767 aircraft, Ship 102, christened “The Spirit of Delta.” At that time, the airline industry was troubled by a weak economy and high fuel prices. After 35 consecutive profitable years, Delta posted a net loss. As a way of expressing their appreciation for the company during a difficult time, Delta employees spearheaded Project 767 to raise $30 million to purchase the aircraft. The grassroots effort was led by three flight attendants and supported through combined donations from employees, retirees and friends. The Delta Air Transport Heritage Museum, Inc. was started in 1990 when a group of Delta retirees launched an effort to locate one of Delta’s first 1940s Douglas DC-3 aircraft. This, combined with consolidation of Delta’s archival collections, created a groundswell of support that expanded into a museum. The Museum was incorporated as a nonprofit corporation in May 1995 and today serves to collect, preserve and present the history of Delta Air Lines. The Museum is housed in two of Delta’s original aircraft hangars dating from the 1940s, which were used as maintenance facilities until 1960.